Historically, one would use an automated chemical decapsulation system to etch samples with copper wires — with minimal success. Even with a low-temperature nitric and sulfuric acid mixture, and even in combination with laser pre-opening, this process works to an extent, but is largely unreliable (with a limited number of sample types and configurations, to boot). Using a proprietary and patent-pending process, the JetEtch Pro CuProtect applies a bias to the solution being pumped to the sample in the process chamber. 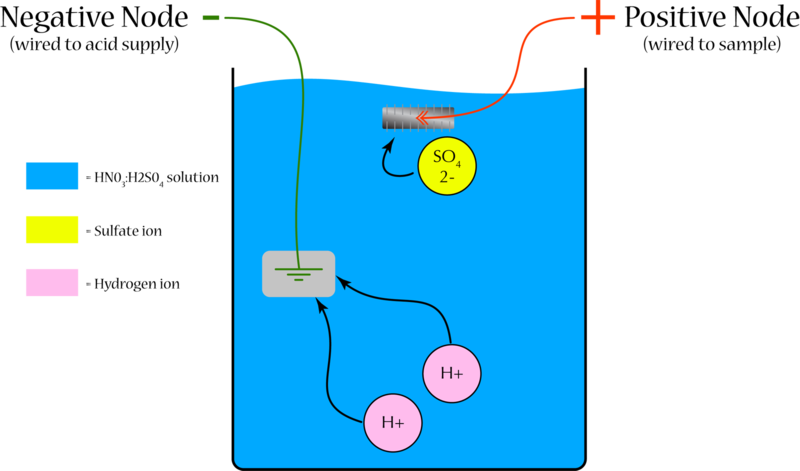 This bias creates a condition in which negatively-charged sulfate ions are attracted and temporarily bond to the surface of the copper wire while the sample is being etched. This temporary sulfate ion coating protects the copper wires from corrosion while the sample undergoes the etching process. In less sophisticated systems relying solely on low temperature etching, positvely-charged hydrogen ions are attracted to the copper wires, thereby making the wires susceptible to pitting, cracking, breaking, and many other undesirable anomalous artifacts that greatly affect or even squelch completely the ability to perform failure analysis after the etching process. The Nisene Technology Group CuProtect system solves this problem. Advances in plastic packaging have resulted in complex packages with very high interconnect densities. The requirements for package opening become very stringent when such high densities are incorporated into packages such as micro BGAs and FPBGAs. Other complex configurations such as multi-die BGAs and Chip Scale Packages pose unique problems. The encapsulant must be removed while preserving the integrity of the die, bond pads, bond wires and leadframe interconnects. To solve these problems, Nisene Technology Group introduced the JetEtch. With over 32 years of experience with decapsulation technology, the Nisene Technology Group JetEtch addresses the ever-changing needs of the semiconductor industry. The JetEtch is easy to operate. Intuitive software leads the operator step by step through the simple programming sequence. Once set, the software enables an entire etching program to be completed with only two keystrokes. The JetEtch is fully programmable and capable of storing multiple etch programs for different package types. A high brightness six-line alphanumeric display ensures good visibility under all conditions of fume hood illumination. The JetEtch Pro Etch Head assembly can be supplied with a standard fixed Etch Head or with an optional removable Etch Head insert. Removable Etch head inserts offer the ability to select specific etchant dispersion patterns for large or complex packages, such as large QFP or extra-long TSSOP devices. Our Indestructium Etch Head is constructed from advanced alloy materials. Three basic removable Etch Head inserts are available: the standard slot design, long slot design, and the QuadraportTM — a multiple-hole design. Additional custom configurations are available to accommodate your specific decapsulation needs. Nitrogen is used to purge the sample cover. The sample cover is lightly pressurized with a continuous stream of nitrogen gas to remove water vapor and oxygen from the region of the etch head, eliminating metal corrosion. When the sample cover first closes it is purged with nitrogen gas at a high flow rate to ensure complete removal of undesirable gas species. The flow then reduces to a low level to maintain a slight positive pressure until the programmed etching and rinse program has finished. At the end of the etching sequence the entire acid path is gas purged to remove all residual acid. Designed by Nisene Technology Group’s Fluid Handling Division (patented), the entire pump assembly is covered by an unconditional warranty for a period of five years, or for a pumped acid volume of 250 liters, whichever occurs first. This warranty is the highest in the industry. The micrometering pump and all associated valves are constructed as a single component. Unibody construction eliminates pump to valve interconnects for high efficiency and exceptional reliability. This pneumo-electric design is the most reliable mode for the micrometering and delivery of corrosive fluids, including concentrated and fuming acids. The pump is activated by gas pressure (CDA or N2). Gas is only required during operation; while in the Stand By/Idle mode no gas is consumed. Precise removal of encapsulant material is achieved by VortexEtch. The constant vortex ratio generated by VortexEtch maintains a regular, gentle oscillation of the etchant across the sample surface, guaranteeing precise and rapid removal of the encapsulant. While the delivery of precisely metered micro volumes of acid etchant is critical for accurate, fast and reproducible decapsulation, this is only a starting point. To achieve the highest possible reproducibility Nisene Technology Group developed VortexEtch, a technique that guarantees optimal results sample after sample. While VortexEtch brings a new level of decap quality when pure (single) acids are used, it is particularly critical when mixed etchants are employed. Unless precautions are taken to ensure thorough and continual mixing, an etchant mix can separate into its constituent parts, resulting in unreproducible decapping. VortexEtch eliminates any possibility of dissociation by integrating fluid micrometering of the mix as it is dispensed to the sample surface. Rapid and efficient etching of PBGA packages is obtained utilizing Pulse Etch. Pulse Etch delivers quick, precisely measured bursts of acid to the package creating a die surface with minimal metal loss. Pulse Etch optimizes the carrying capacity of the acid enabling the removal of large quantities of encapsulant with minimal acid consumption. BGA Package Process conditions: 20% fuming sulfuric acid at 250°C Etchant volume 4 ml per minute. VortexEtch or Pulse Etch are so efficient that the JetEtch uses very little acid. For most packages an acid volume of 1–2 ml per minute is all that is required. VortexEtch not only guarantees uniform mixing of etchant, but it also ensures that acid flow across the sample surface is in an oscillatory motion to rapidly remove the encapsulant. This oscillatory motion moves the selected acid volume across the sample surface every two seconds, but the total amount of acid used per device is very small. Pulse Etch has the same efficiency for PBGA packages. The JetEtch design is at least 30 times more efficient than less sophisticated acid decapsulators not equipped with VortexEtch and Pulse Etch. Such machines would have to have an acid flow rate of 30 ml per minute to produce comparable results.